Pizzeria Bianco and More - Ambassadors of World Food Tourism. 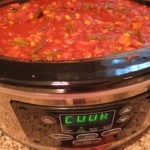 We know that Italian food is some of the most popular in the world. And it’s one of our favorites too. So we’re pretty picky when it comes to pizza. But if you have a reason to be in Phoenix, Arizona, or can make one up, you might just find one of the happiest surprises in the culinary world. Pizzeria Bianco offers an incredibly good artisanal pizza by an incredibly good chef in an incredibly good-weather location. 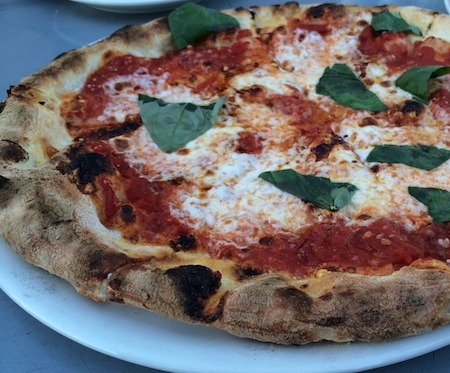 Pizzeria Bianco is a standout in the world of pizza, primarily because of the fresh ingredients, creative combinations and artisanal approach of chef/owner Chris Bianco. Chris started Pizzeria Bianco inside the back corner of a neighborhood grocery store in 1988. 15 years later, he won the James Beard Award for Best Chef: Southwest (2003). Knowing that the best ingredients make the best dishes, Chris joined with Rob DiNapoli, an expert canner, to create a line of organic whole peeled tomatoes. 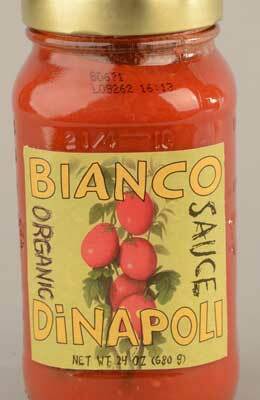 Now expanded to include crushed tomatoes and tomato sauce, Bianco DiNapoli products are available in retail shops and fine grocers, including Whole Foods in Arizona and California, with more outlets to come. He has also opened Pane Bianco, 4 blocks away, originally to serve foccacia sandwiches with bread baked to order for takeout, Pane now is a full service restaurant. But back to the food at Pizzeria Bianco. There are delicious options for salads and small plates. 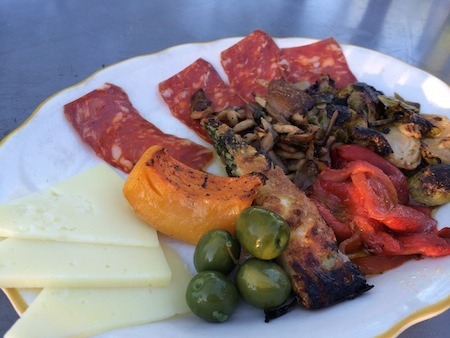 We started with the delicious antipasto, a delicious combination of wood roasted vegetables, sorpressata and cheese. Then on to the main event. 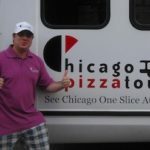 Pizzas come in various styles, such as the traditional Margherita with tomato sauce, fresh mozzarella and basil to the creative Sonny Boy with tomato sauce, fresh mozzarella, salami and gaeta olives. If you can’t decide what you want, or you want to try a few different types, you can do what we did – a half and half. 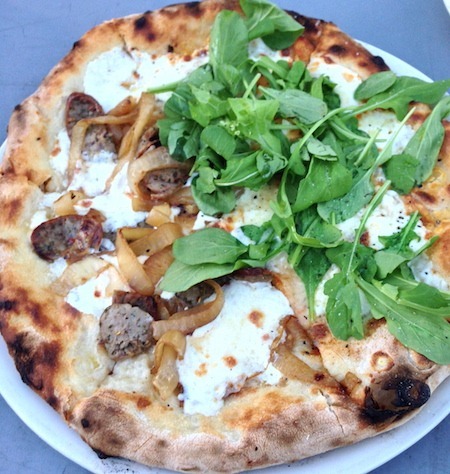 In our case, we split a pie into the Wiseguy a sauceless pizza with wood roasted onion, house smoked mozzarella and fennel sausage and Biancoverde with fresh mozzarella, parmigiano reggiano, ricotta and arugula. 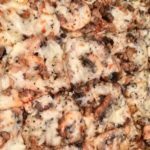 You can stick with their combos or add some of your own options like wood roasted organic mushrooms, organic ‘la Quercia’ Prosciutto Americano or Agostino Recca Sicilian Anchovies. And to complement your tastebuds, you can order a glass of local wine or cold beer from Bar Bianco next door, where, incidentally, you can also just hang out before or after dinner. The whole atmosphere is relaxed, friendly and comfortable. 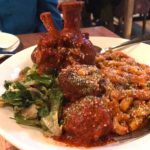 With a couple of locations under their belt now and logical expansions like Pane Bianco and the Bianco DiNapoli products, you’re likely to find Chris Bianco’s passionate palate working its way beyond the southwest. In the meantime, if you happen to be in or around Phoenix, be sure not to miss this worthwhile bite. 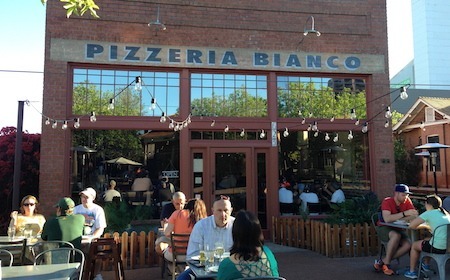 THE QUICK BITE: Pizzeria Bianco in Phoenix Arizona offers an incredibly good artisanal pizza by an incredibly good chef in an incredibly good-weather location. 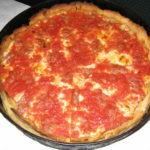 Chicago Pizza: Thick or Thin?